A clamp coupling will help avoid damage to the shaft and will absorb mis-alignments. Gears, pulleys or sprockets mounted at the outer extremity of the shaft may lead to bending, and eventual failure L Mounting the gear, pulley or sprocket as near as possible to the gearbox body helps reduce leverage on the shaft, although shaft fatigue may still result. Mounting a bearing at the end of the shaft supports it and minimises the risk of bending, thus protecting the shaft. OPERATING TEMPERATURE RANGE: from 0°C ? +70°C. We can use special greases for use between 55°C and +155°C, as well as sealed bearings (2RS) up to +120°C.. MODIFICATIONS: We can equally modify the reducing gearboxes, add a keyway or channel for a circlip, modify a drive shaft. Contact us with your specifications? All user modifications of a reducing gearbox will result in voiding the guarantee. UTILISATION: It is recommended that a flexible coupling be used to link the reductor to the rest of the system. Reducing gearboxes are designed exclusively to reduce speeds, never to increase them. Because of this, we are unable to guarantee the operation of a reducing gearbox when used inversely as a multiplier. 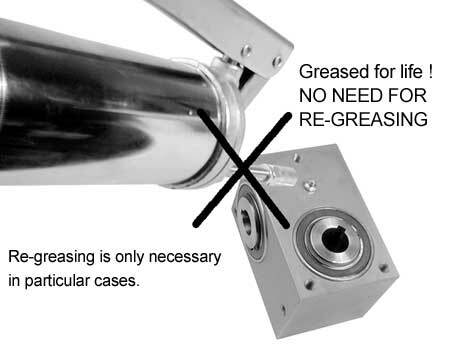 GREASING: Reducing gearboxes are greased for life, and are completely maintenance free. In case re-greasing is necessary, do not overfill with grease, this could block the gears and cause overheating.